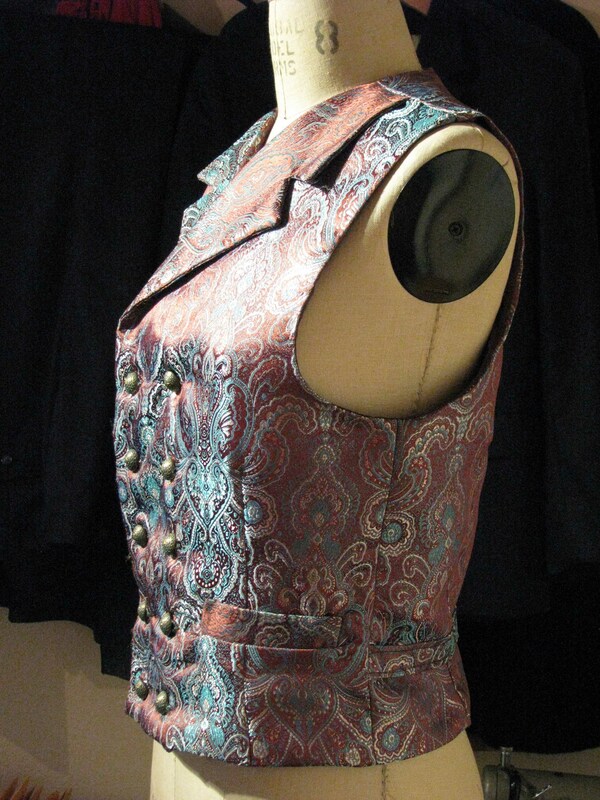 This is one of the waistcoats that we designed to go with our early Victorian double-breasted tailcoat style. We wanted a vest that would cut away straight at the hem, exposing a few inches of the waistcoat fabric when the coat was closed. 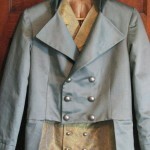 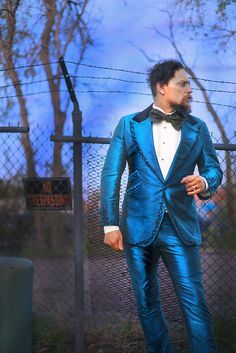 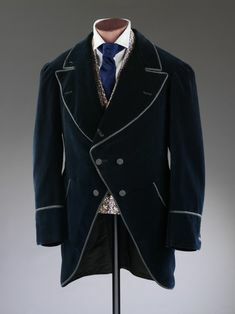 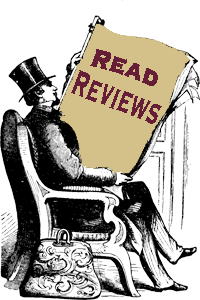 The result has proven popular both with our formal/wedding/tailcoat customers and those who want something with a bit of steampunk flair to wear out with jeans or a pair of slacks to loft parties and clubs. 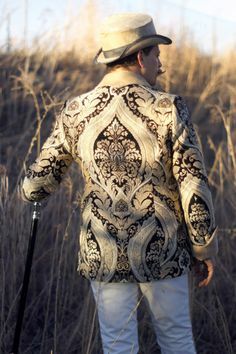 The version in the first picture is one of our favorites. 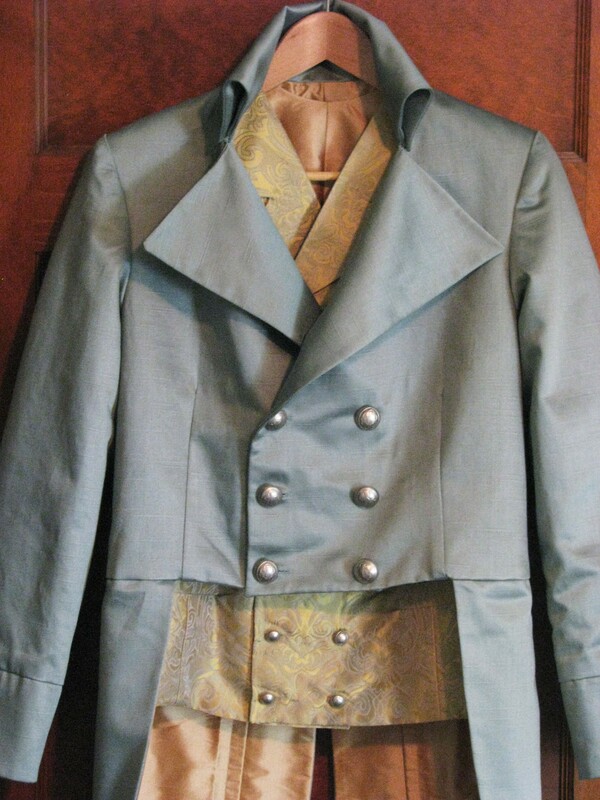 The fabric is an iridescent rayon brocade with a paisley design and green copper buttons. 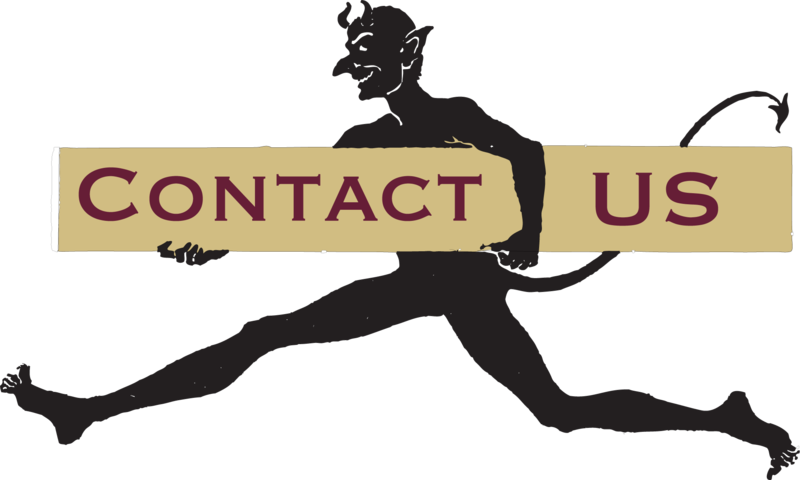 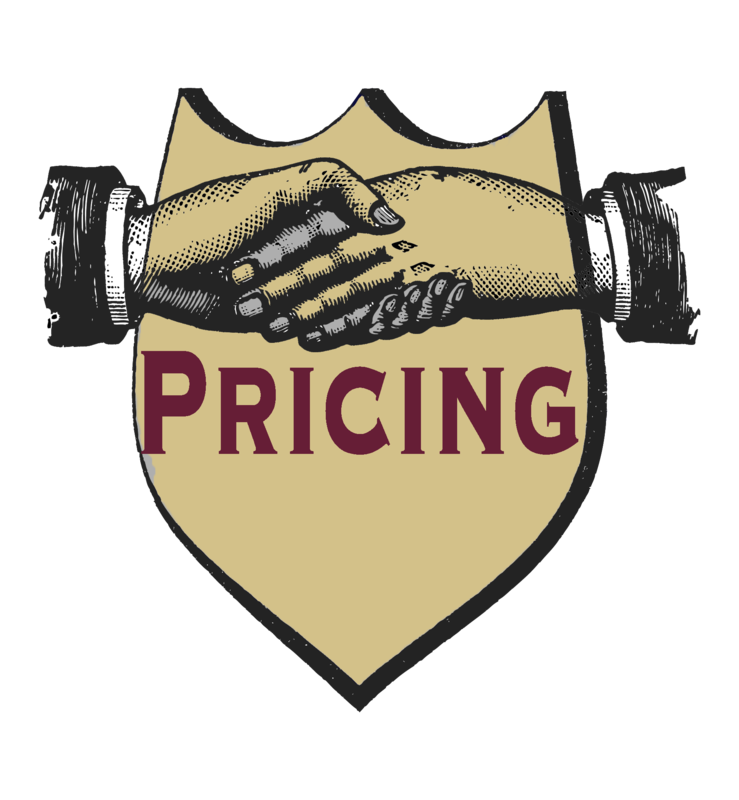 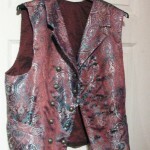 The fabric is alternately red, burgundy, wine, and brown depending on the angle at which you see it from. 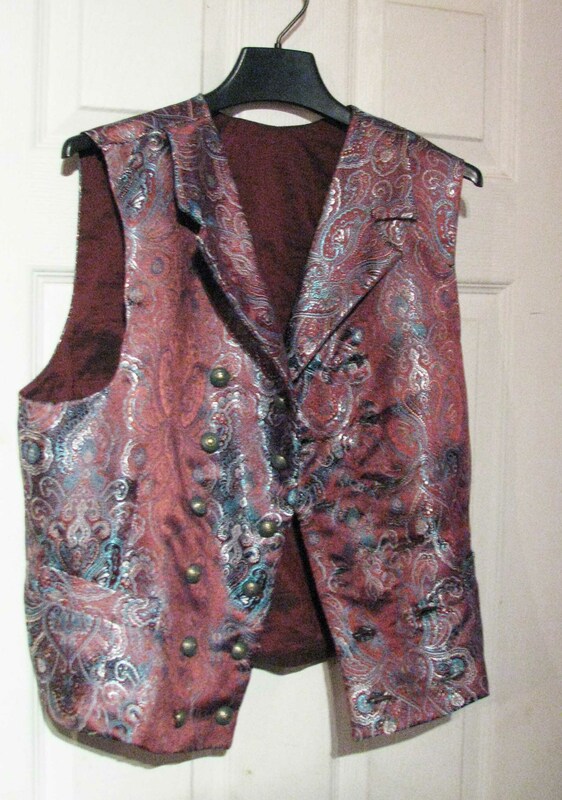 The vest shown with the tailcoat is made from a very fine silk brocade, also with a paisley design. 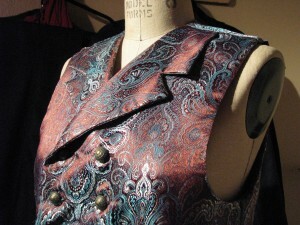 The beauty of these vests is that one can really alter every detail. 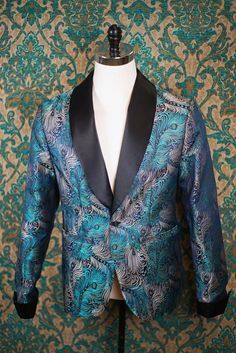 For example, we can make the same style of vest, but in a single-breasted version, or with a peaked lapel or notched (triangular hem). 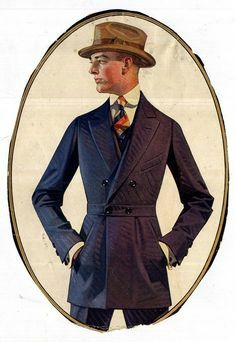 Another thought would be to make a shawl style collar in a contrast fabric. 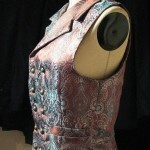 Brocade Double-Breasted vests generally run about $248 when you send us your measurements or $295 with a muslin version to ensure a perfect fit (recommend when ordering the piece for a wedding or with a muslin fit suit).